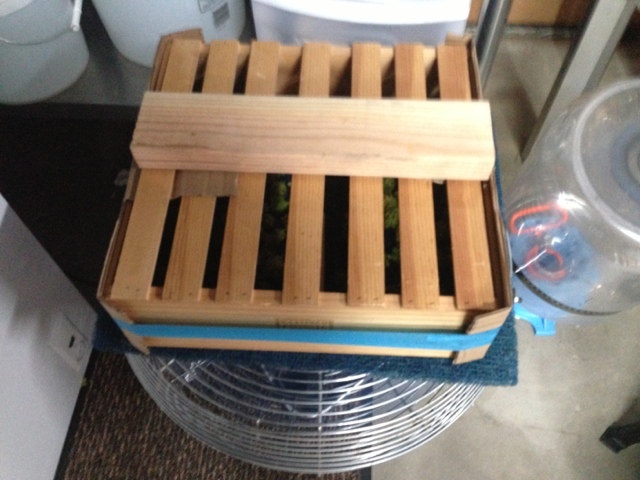 Posted on August 20, 2013 by Tap This Brewing Co.
It’s harvest time for my 1st year hops…so I think. Based on several readings, my hops may be towards the end of ripeness, but then again, maybe they are juuuust right. 1st year crops are not expected to yield much, if any at all. The main role for that 1st year is to grow a good root structure so it can come back the following year very strong. I picked both Centennial and Chinook hops, and by the looks, I’m thinking maybe I will get a half ounce each once they are dry. Picking was easy, except I did need a chair to get to the top of my trellis. The Chinook hops were larger cones than the Centennial you see in the photo below. Now what? Well you can use them fresh, however I wasn’t ready to brew. So, I have to dry them. It takes about 3 days to dry hops if done properly. Since I had a small harvest, I was able to do the crazy thing you see in the photo below. Next year I will have to figure out how to dry them more in bulk. I took a large fan and tilted it straight up. Placed a filter pad on top of the fan, then the hops, and the to keep them somewhat contained, I had an old CD rack that I flipped over. It seems to be working well and I hope they turn out good. Once dry, I will measure them out, seal them up either in a ziplock or seal-a-meal bag, then freeze. I plan to use them in my next brew, hopefully within the next couple weeks. Can’t wait! Posted on August 9, 2013 by Tap This Brewing Co. Some craft brewery memorabilia I picked up on a road trip. It now adorns my homebrew fermentation chamber. Posted on February 13, 2013 by Tap This Brewing Co.
Hops are one of the key ingredients to beer and I’ve come across several home brewers who grown them. I’ve done a little gardening in the past and thought that I could grow hops, no problem. I ordered rhizomes from NikoBrew.com, particularly Cascade, Centennial, Chinook, CTZ (Zeus), Golding, and Northern Brewer. I figured this would allow me to have a good variety of fresh hops to brew from, thinking that I would yield at least a few ounces from each plant. There are many vendors that sell hop rhizomes, with the majority offering pre-orders beginning January/February, and the product to be shipped mid-April. They are relatively inexpensive and some vendors sell second year rhizomes, potted hop plants, and root balls instead – these options may give you more yield in the first year. The essentials I learned at this point is that hops like a lot of water, but need a lot of drainage. They need something tall to grow onto, like a trellis, since they can grow up to 12 inches per day. I am reading more about growing them and hope to create a page with all the key details I’ve come across, along with some links to valuable information. I hope my my thumb is green enough. I will try to post pictures during the entire first years process.